It seems so natural an idea that it should come as no surprise that the Capcom developers themselves have considered it many times. As we’ve seen here and here, these characters have not made it too far past the initial concept phase. However, there has been one rival character design did manage to make it into a game. Art (Japanese name: “Artillery”) is a young man who appeared in Legends 1 as a researcher who was out to solve the mysteries of Kattelox Island. 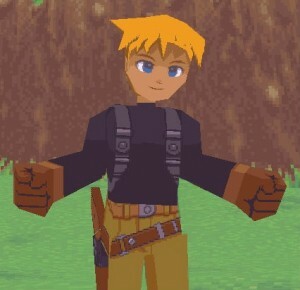 With his golden hair, gray backpack and gun belt on his hip, he stands out for having a unique design from other NPCs. MegaMan can first meet him at the Junk Store, and then several more times at various locations throughout the adventure. If you head back to the Library right after defeating the Balkon Gerät (and before collecting the Lake Jyun Sub Gate refractor), you’ll find him and Barrell researching the Legendary Disaster together. 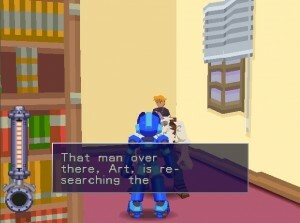 This also happens to be the only part of the game that mentions Art’s name, and can be easily missed if you clear the Sub Gate right after the boat battle. As a result, his name is still unknown to many. Back in one of the early scenarios, Rock was going to have a romantic rival competing for Roll’s affection. (Dare we say she would have even been charmed by him…) That event got cut out over the course of production, and now only that character remains and still appears in the game. He’s Artillery, the fair-haired young lad wearing the side arm. He shows up in different places like the junk shop and the library, but never stays in one place for too long, so keep an eye out to talk to him. (This is why he’s lucky enough to be named, despite not being too important in any of the game events.) Bring Tron into the picture, and you’d have an amusing four-sided love triangle. Between those deep blue eyes, that clean-cut-yet-rugged action-archaeologist style, and an intellect to amaze even Professor Barrell, it’s not hard to see how he could have earned Roll’s or even Tron’s favor. What passionate girl burgeoning on the cusp of womanhood wouldn’t want a relationship with this handsome, well-mannered guy? New better picture! Thanks, Zach Storm-Eagle-Eye! But in the end, it was not to be. His design was kept in the game, but his role was reduced to that of an interesting but ultimately unimportant background character. How might them keeping that plot point have changed the dynamics of the characters? 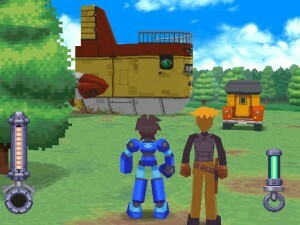 We don’t see MegaMan get jealous too often, but could this love quadrangle had brought out that side of him? Hard to say how the change would have affected things. In Legends 3, the role of the male rival will at last be filled by Barrett, charismatic leader of the biker gang the Bright Bats. He already seems to have the attention of our newest heroine Aero. Will there be any romantic links between him and our other Legends leading ladies? And once he gets off that rock, how will MegaMan himself be dealing with this new hero on the block? We’ll have to wait a bit longer to find out. Meanwhile, the adventure may have ended for Art, who has yet to make another appearance in the series (and perhaps never will). All the same, his place in Mega Man Legends history is secured as the young man who could have been MegaMan’s rival. 5 Comments to "Legendary Artillery"
So none of the Bonnes are considered to be MegaMan Volnutt’s rival…? Is it just because none of them wear lots of red with something yellow trailing behind them? At one point in the library, Barrell actually calls him Artillery in English, too. I forget where, though. Got a better picture that covers up that unsightly Volnutt. Thanks again, Zach! It’s true we’re dealing with a fairly narrow definition of rival that would require it to be a singular male of approximately the same age who would operate similarly (no robot piloting) and with comparable skill, and is also in direct competition in some way (treasure, love, anything). Otherwise, MegaMan has tons of rivals already.